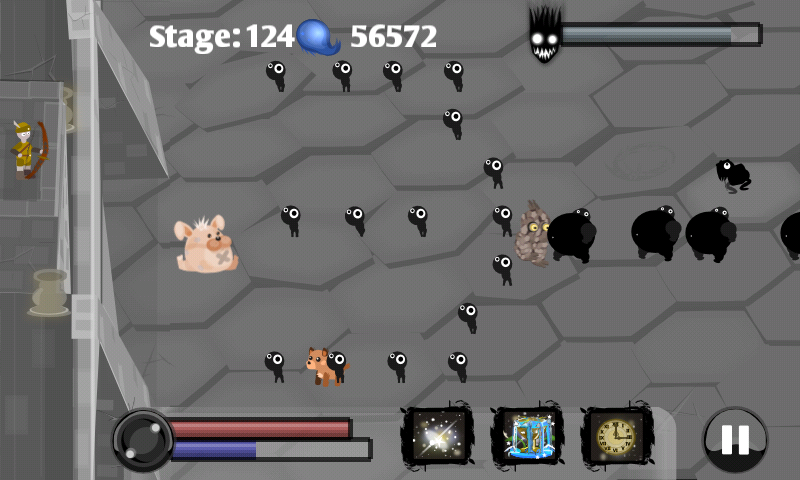 Read the review of a new tower defende game on Google Play- Nightmare Defender from djantel-ware.com. See how interesting we found this game to be, read about its gameplay, know the tips and tricks and see if it interests you or not. 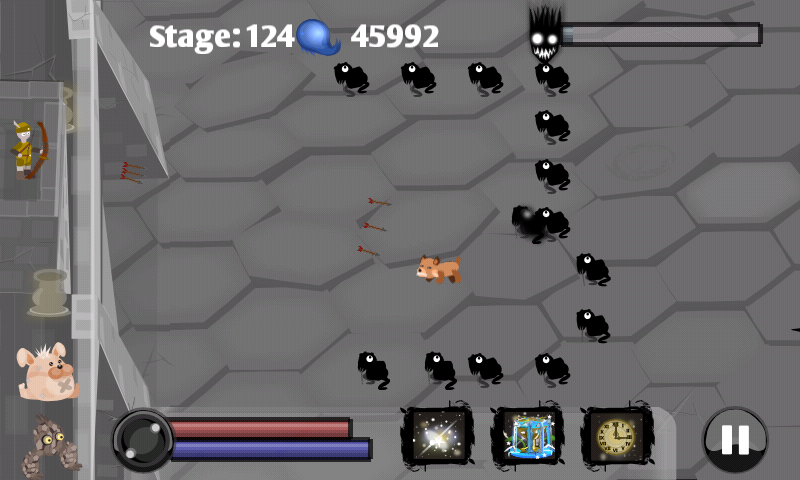 Nightmare Defender is a new tower defense game released for Android platform. You character is an archer who has to fight the creatures of dark to prevent your tower from being brought down. You have some help in form of guards that will help you fight back the dark creatures and your own magic and arrows which can tackle this continuous horde of creatures. You start off alone with a simple bow that can fire one arrow at a time but with each kill you acquire XP and gold coins with which you can upgrade your skills, train pets and upgrade your and you pet's magic. As you progress the game keeps introducing new enemies and to keep up with them you also need to keep upgrading your arsenal and pets. There are basically 15 attributes into which you can use your XP points to increase your skills like strength of the bow, firing speed of bow, chance to fire a special arrow, the power of the special arrow, the defense of your tower and the chance to be reborn again in case you fail to defend your castle. Besides that you have 3 types of magic each having 3 sub-types like a Light Magic attack which will weaken the enemies in a particular area, in a row or all the enemies in the arena. These have to be upgrade using the gold coins. Other than the personal arsenal of bow and magic you also have some pets that can come very useful. First there is a pet dog that keeps on fighting in the arena along with you all the time. It has two attacks - direct attack and magical attack. You should keep upgrading it to increase its strength, the frequency with which it attacks and the number of times it does magic attacks. Second is the a rock guard that damages all the enemies in a row. In the initial levels it will annihilate complete row of enemies thus making it very useful when you are in trouble with the dark creatures at your gates. Third is a soft toy bear that goes and sits in the arena where you want it to and prevents any enemy to reach the tower. It has its own stamina on how long it can block the attacking animals and this too like your other guards have to be kept on upgraded to make their strength comparable to that of the enemies. You should keep upgrading the level of your pets too to improve their skills and appearance. There are Levels and Stages. 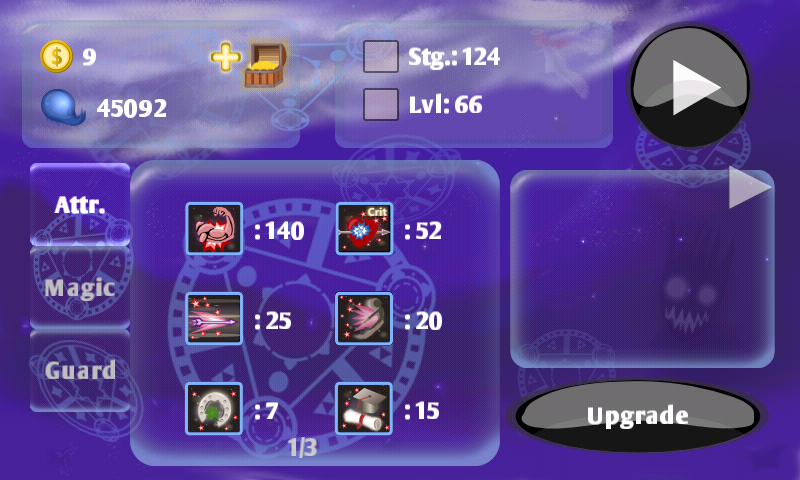 Stages in the number of games you win and Level is your personal experience level in the game. Both are independent of each other but your level plays an important role in unlocking advanced magical attacks. The magical attacks like that of doing a Light attack on the whole arena is one which you can unlock only after crossing level 50. The set up is small and the game itself takes very less memory to run on. It runs om Android version 3.2 and above. The game is very simple to understand and you can directly start playing it. Just press the area above your enemy and you character will start shooting arrows over it. I have crossed 126 Stages and 67th Level at the time of writing this game and that speaks volume about the fun I had playing this game. By my experience I can say that your bow is your best friend in the game. 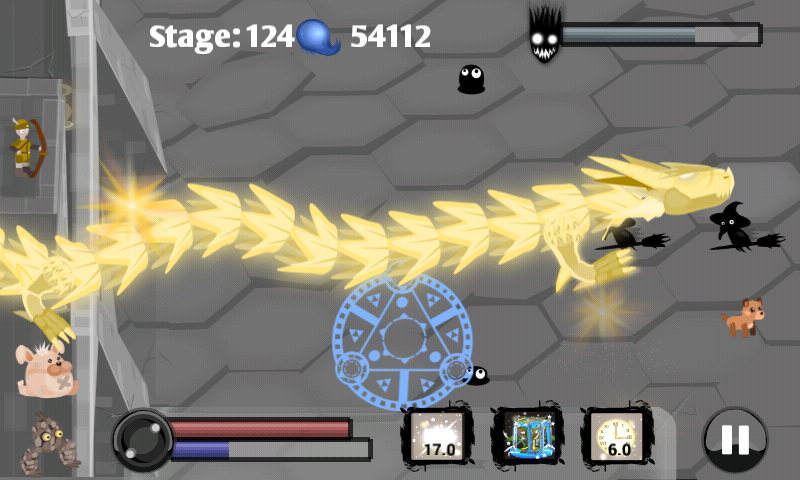 You need to keep its strength up in the game if you want to cross more stages. There is also a Multiarrow upgrade that can make your bow attacks too powerful that in the later stages it becomes almost too easy for the creatures to come anywhere near you. But before you can reach the required experience level to upgrade the Multiarrow feature your guards will play the most important role. The graphics are nothing fancy and the audio syncs well over the gameplay. 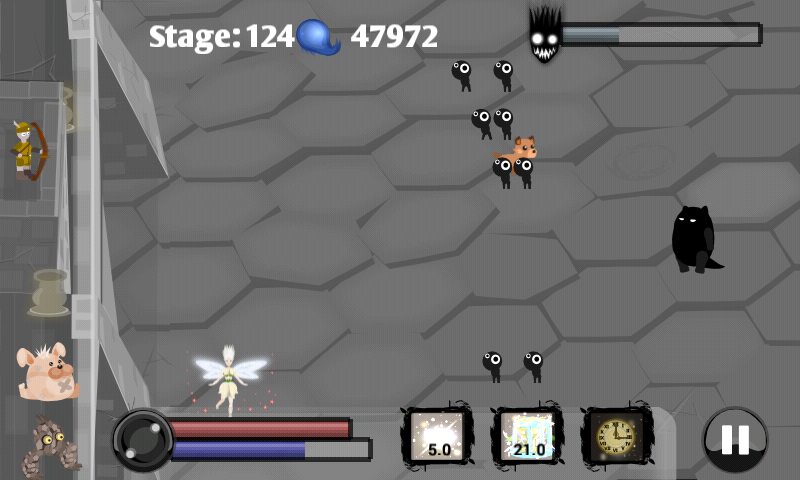 Magic attacks display cool and cute characters doing magic but otherwise the background is set in a dark stage well suiting the title of the game. Being a free game, advertisements can become a little irritating but thankfully they come only at the end of stage. The later stages though become quite easy once you have upgraded your bow to shoot 3 arrows at once. Enemies are not able to cross even half the screen if you keep on firing the arrows indiscriminately and this is where the interest to play the game goes down. You start earning a lot of XP and upgrading your attributes keeps you at much higher levels than your enemies. 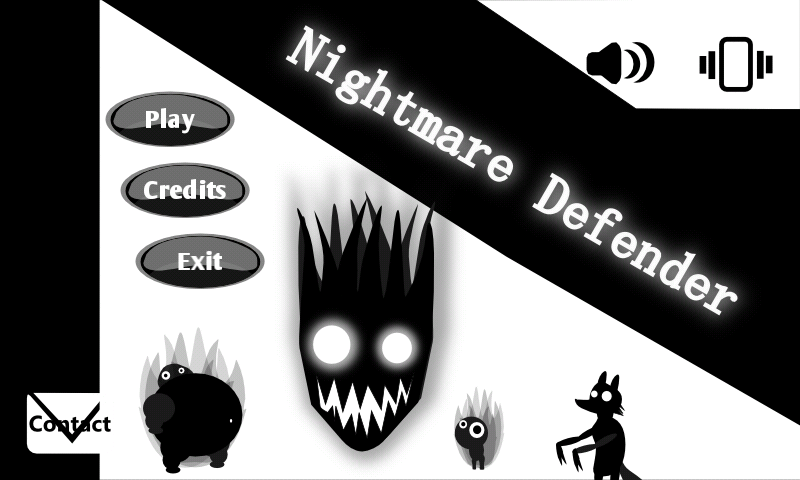 Nightmare Defender is an interesting game to play with simple gameplay and user interface. It is a based on the freemium model with the ads poping aesthetically so as to not to spoil your gaming experience. Lots of weapons and magical upgrades along with addition of new enemies keeps the game interesting for many stages but once you have upgraded too much you might find the game bit too easy to keep your interest into it. Simple yet challenging gameplay, a host of weaponry and new creatures keep the interest alive. You won't want to leave it for many stages to come. 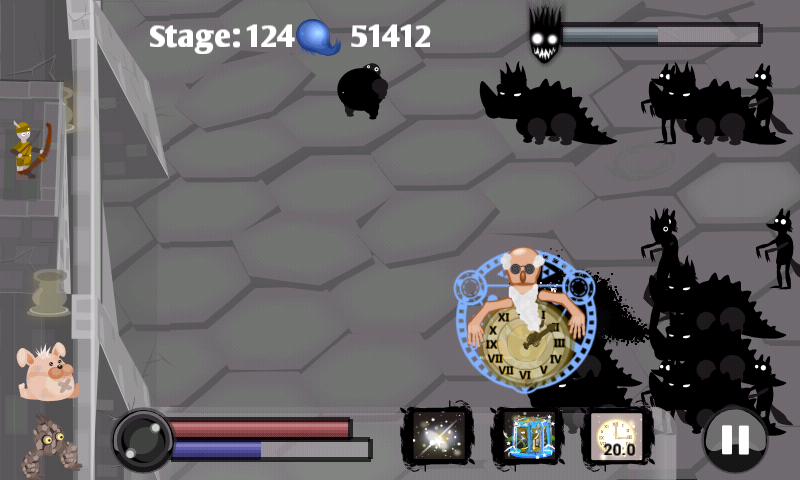 The upgrades have not been properly synchronized with the gameplay the result of which is that higher stages become too easy to clear.